The George Earl prints and pictures below, represent a small selection of works available. If there is anything by George Earl that you’re looking for them please contact us on 07889 800857. 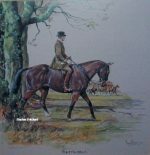 George Earl was a keen sportsman and this is reflected in his work and reputation as a dog painter. He was also an early member of The Kennel Club. Although chiefly remembered as a canine artist due to his success depicting them, of the nineteen paintings Earl exhibited at the Royal Academy between 1857 and 1882 only two were of dogs. Going North and Coming South – Two pictures commissioned by Sir Andrew Barclay Walker of the Walker Brewery, the paintings are bustling narrative works depicting railway station life. Now owned by the National Railway Museum they were rescued in 1990 from a Liverpool pub (The Vines in Lime Street). Going North tells the story of a group of friends travelling from Kings Cross to Scotland for the summer grouse shooting season. The partner work Coming Southshows the group a month later at Perth Station, about to make their return journey. The works show much of the minutiae of Victorian station life and also include Earl’s trademark sporting interests in the form of dogs and grouse. 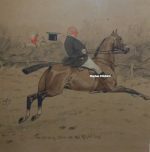 The Carlisle Otter Hounds, Striking the Foil – a huge and magnificent work of 20 dogs, including Bugleman, a famous hound in his days, and the entire Carlisle hunt in pursuit. It took George Earl 1 1/2 years to complete the work. It was purchased by Mr. Hermanus Koekkoek, a well known artist in his own right, who displayed the painting at his Gallery on Piccadily, London where he charged a shilling to view the work. Champions of England – A series of portrait studies of dogs heads painted in the 1870s, the works were illustrated in a book of the same name.